Finding Dory misses the spark of originality Pixar is capable of at its best. Before Finding Dory, as has been traditional with Pixar's animated features, there's a short film as a kind of cinematic appetizer. Alan Barillaro's Piper—the tale of a young sandpiper learning the hard lessons of how to forage for food at the ocean's edge—is an absolute delight, from the astonishing photorealism of its lighting to the emotionally rich (and fairly literal) interpretation of the old "give a man a fish/teach a man to fish" aphorism. It's funny, sweet and richly imaginative. And it was the most memorable thing about the experience of watching Finding Dory. There's an irony to the fact that Pixar's current direction with regard to its features seems more frustrating because of the possibilities highlighted by their own shorts. While the Pixar braintrust doubles down on its focus on sequels—another Toy Story, a third Cars and a second Incredibles feature are in line behind Finding Dory, with one original story squeezed in there—the shorts show us that the talent at the company can create original work that is both technically and emotionally engaging, and often flat-out hilarious. There's nothing particularly wrong with Finding Dory. It's just hard not to realize how much more Pixar is capable of when they're not playing it safe. Writer/director Andrew Stanton opens with a prologue taking us back to the childhood of the blue tang Dory, showing the origin story of how the forgetful fish was separated from her parents, leading up to the fateful day when Dory (Ellen DeGeneres) met clownfish Marlin (Albert Brooks) for the events of Finding Nemo. One year after those events, Dory is still settled in with Marlin and Nemo, but a flash of memory includes a clue to her parents' possible whereabouts. Setting out across the ocean with Marlin and Nemo (Hayden Rolence), Dory eventually reaches a California aquarium for an adventure that might reunite her with her family. And it is an adventure, which Stanton understands well (even in his pilloried live-action John Carter). The set pieces are orchestrated with great energy and sharp comic timing, from a dangerous chase involving a giant squid to a climactic plan to stop a truck as it takes our heroes from the aquarium. There are basics of cinematic storytelling that make it easy to engage with a story like this, and Finding Dory hits those beats with absolute professionalism. What's missing is, not surprisingly, a sense of discovery. It's not just that some of those set pieces feel familiar, like the aforementioned squid chase playing like a mix of Nemo's shark chase and anglerfish chase sequences. Finding Dory simply misses the opportunity to do the only thing that really gives a sequel an advantage: deepening the relationships between the characters we already know. 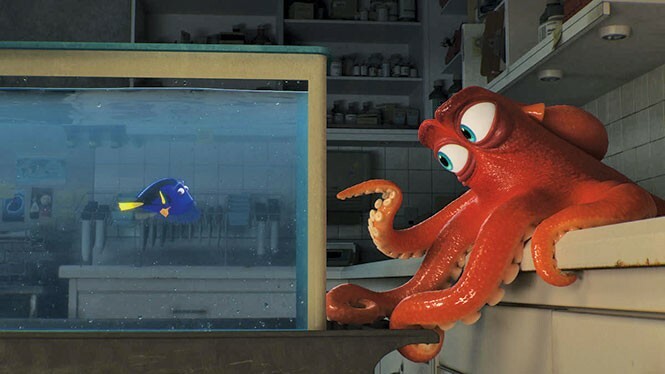 Dory is actually separated from Marlin and Dory for the majority of the film, primarily interacting instead with new characters like a camouflaging amputee "septopus" named Hank (Ed O'Neill) and near-sighted whale shark Destiny (Kaitlin Olson). While the cynical view would be that these characters were created simply to provide new merchandise to sell, the real problem is that they're just not interesting enough to make up for the lack of connection in this story between the characters we came to see, because we care about them. It is perhaps enough that DeGeneres still inhabits Dory with such soul and commitment. Her voice performance in the original was magnificent, and she's nearly as good here, wrestling with the doubt and negative self-talk that so many people confront when living with disabilities. Indeed, the real power of these two movies may be in their ability to normalize those who struggle with physical or psychological limitations, never offering them magical cures but allowing them to come to terms with what they can accomplish. As a lesson for young viewers, that shouldn't be underestimated. We also shouldn't underestimate what Pixar's creative team can do when they're at their best. As solidly satisfying as Finding Dory is, it also ends more or less where it begins, offering a payoff that seems like a foregone conclusion the moment Dory sets off on her journey. You could do a lot worse than another Dory story. You could also do, with some of the same spark that shows up in Pixar's short films, a lot better.